The Tuna Nationals Fishing Tournament is organised every year (generally in May) in the area of Cape Town by the South African Deep Sea Angling Association (SADSAA). Sport fishing anglers compete to catch tuna and other pelagic fish during this 1-week long tournament, with various prizes are awarded. 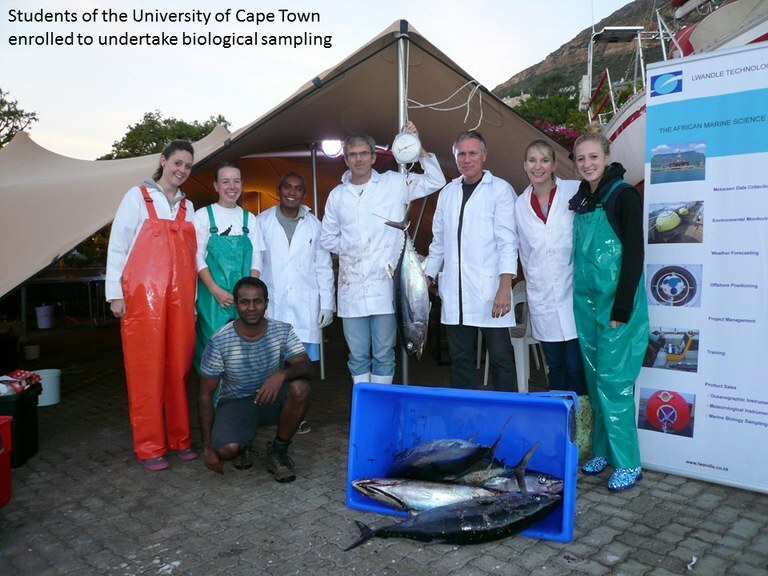 It was thought that having so many fish being landed in a short period of time was an excellent opportunity to train the students how to perform biological sampling on freshly-caught fish. This activity was started in 2010, under the supervision of A/Prof. 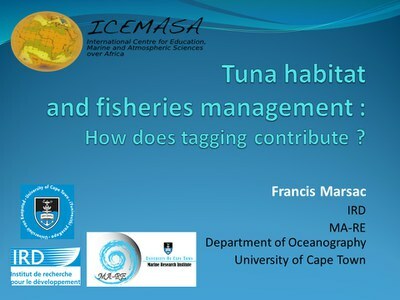 Colin Attwood (UCT/Dept of Biological Sciences) and Dr Francis Marsac (IRD/ICEMASA). In general, 200 to 300 fish are sampled for scientific purpose. The most abundant species is the albacore tuna (Thunnus alalunga), also know as longfin tuna in South Africa. Large size yellowfin tuna (Thunnus albacares) are also caught in large numbers. 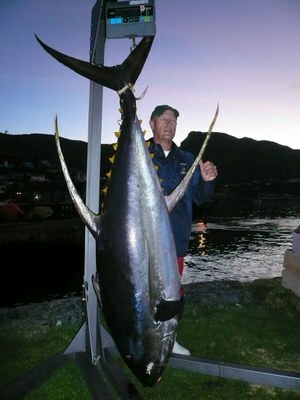 In 2012, a record was broken with a 106.8 kg yellowfin caught on a 10kg line, (angler: Frank Scholtz) , claimed as a national, African and world record (IGFA). Fish are train to dissect the fish for different purposes. During this process liver and muscle tissue samples are taken for further analysis. Each fish is sexed and its gonads examined to see the maturity level of the fish. The stomachs are also sampled to determine what the fish has been preying upon and the gills removed to search for parasites back in the lab. Otoliths, which can help to tell the age of each fish and determine how fast they grow, are taken from the yellowfin and some of the albacore. All of the tuna are then donated to charities so they would not go to waste. 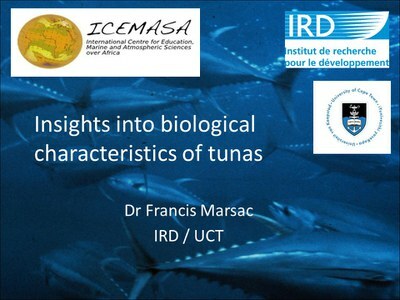 During two of these tournaments, Francis Marsac (IRD) gave to talks on tuna tagging and biology to a broad audience mainly composed of recreational fishers.